I can recommend our hotel at Dubrovnik, which was the Valamar Argosy, on the coast at the outlying district of Babib Kuk (which, we were told, means “Grandmother’s Hip”, owing to a Turkish misunderstanding of the Serbo-Croat name). It had good rooms, good food and a splendid outdoor pool, and had the inestimable benefit of being the terminus of the No. 6 bus to the old city, so it was impossible to get lost. Ciccadas were very noisy in the trees, and swifts were flying very low. We had two days in Dubrovnik, separated by an expedition into Montenegro; a very strange country. The only currency accepted there is the Euro, which is surprising because Montenegro is not a member of the E.U. It was suggested to us that the principal business was money-laundering, as shown by the fact that there were no British banks to be seen, but plenty of Russian ones. To coin a phrase: I couldn’t possibly comment… In the wars of the 1990s, the Montenegrans supported Serbia in the bombardment of Dubrovnik (see later). and then at the city of Kotor itself. Both these places were devastated by a massive earthquake in 1979, and were rebuilt as they had been; but as my parents’ Communist-era guidebook said, it was unlikely that all the architectural details could ever be reconstructed. So Kotor is still a mediaeval city, with defensive walls running up the precipitous mountainside behind, and a tangle of alleyways from which motor vehicles are excluded. We were issued with maps, but since hardly any of the narrow, twisted streets bore names, it was very easy to get lost. I found the easiest strategy was simply to hand the map to a shopkeeper and ask to be shown where I was. Eventually I managed to find the cathedral and other impressive buildings. But the highlight of the week was always going to be Dubrovnik. It was once known as Ragusa: a strongly-walled mercantile city-state on the Dalmatian coast, which for centuries managed more or less to retain its autonomy by striking a balance between the neighbouring powers of Venice, the Ottoman Empire and Austria-Hungary. It was even occupied by Napoleon’s troops for a brief period in 1806. In 1815 it was incorporated into the Austrian Empire, and after 1918 assigned to Yugoslavia. This was the position when my parents visited in the 1970s, but when the Yugoslav state fell apart Dubrovnik came under attack from Serbian and Montenegran forces in 1991-2, and was badly damaged by shellfire. Repairs have been made, but the episode has not been forgotten: there are maps posted around the city showing the extent of the destruction. 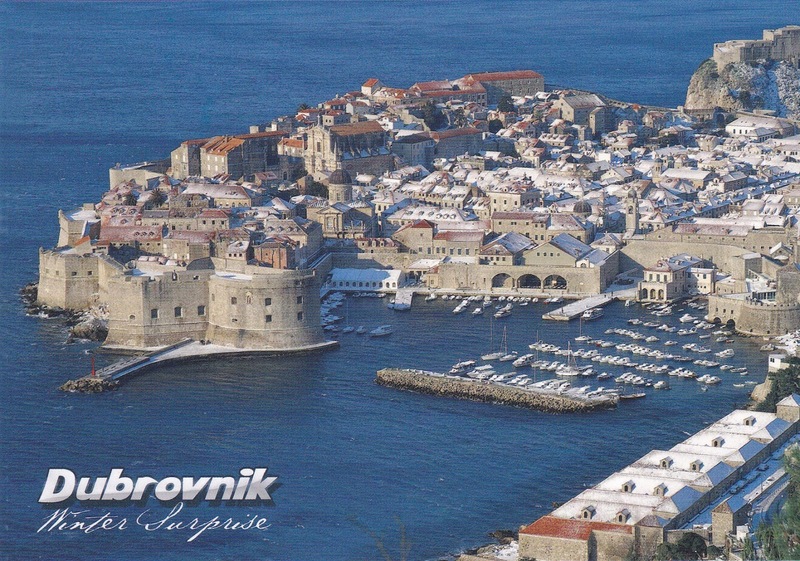 The classic view in Dubrovnik is the street called the Stradun, which leads eastwards from the Pile gate. before reaching the Square of the Loggia; the centre of the city. or out to the Elaphite Islands. but the classic view is obtained by taking the cable-car to Mount Srd, where there is also a monument to those who died defending the city in the 1991-2 "Homeland War"
All this barely scratches the surface of what there is to see in Dubrovnik! Yes, in some of the pictures you can see scaffolding and protective fencing. Some of the masonry would be expensive to reproduce in any circumstance.